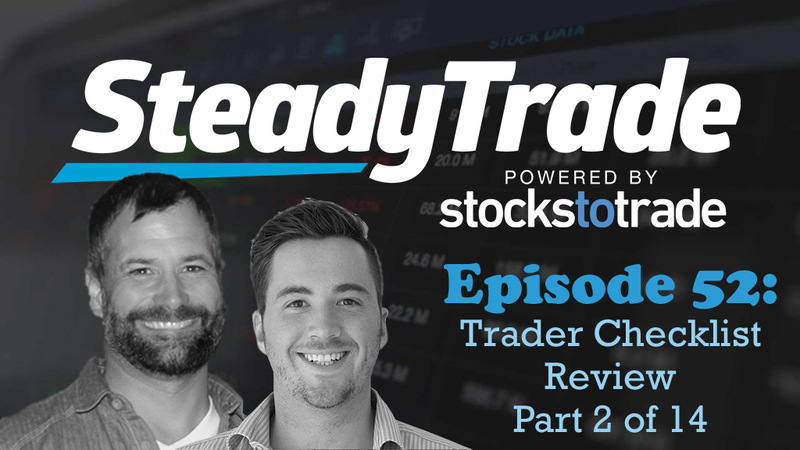 Today’s episode of the Steady Trade Podcast is the second installment in an exciting new series wherein hosts Tim Bohen and Stephen Johnson spotlight some of their favorite trading resources. In our last episode, they began a discussion about Tim Sykes video entitled Trader Checklist. This episode continues the review of the video, with more clips and commentary. Once again, be sure to check out this episode on YouTube to see the accompanying video! Just to recap, Trader Checklist is a video by Tim Sykes which features 14 chapters of invaluable trading information. For each category and indicator covered, he’s set a numerical value of importance. It’s available for free online, so don’t miss this incredible resource! To sweeten the incentive to check out this incredible video, Tim and Stephen have created a giveaway! To enter, first, you need to watch Trader Checklist. Then, at the end of this multi-part episode, you’ll take part in a quiz, numerically rating stocks per the system in the video. If your grade matches Tim Bohen’s grade, you will win a prize (still TBA). Where did Tim Sykes get the idea to rate stocks? He discusses some of his inspiration for rating stocks and how he chose the indicators listed in his Trader Checklist formula; you’ll learn about the CAN SLIM acronym, which every trader should know! 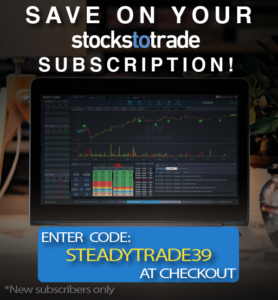 The Steady Trade take: Tim and Stephen discuss the benefits of an indicator based approach to penny stocks and how while it might seem simplistic, it really does pay off. Tim addresses how many people think that short selling is a big conspiracy. He uses the example of Sirius XM radio, which many thought was held back from its true potential by scheming short sellers. and explains how that’s not the case at all; it’s all about shares outstanding. The Steady Trade take: Tim and Stephen agree: supply and demand is what rules what happens with stock prices going up or down. No matter how much you believe in a company, It’s shares outstanding, float (the shares that are available on the free market), and volume that you need to consider. They discuss why. Tim talks about a trader he admires and shows some of his public trades before he went pro. He uses this as an example of how to look at a successful trader’s trajectory and methods, and how he or she narrows down his stock choices, and to learn from this information. The Steady Trade take: By looking at traders’ successes, you can begin to reverse engineer what they did correctly. No, you can never copy any trader to the letter, but you can use their success as a resource and inspiration to form your own method of filtering down trades to meet your personal criteria. Here, Sykes focuses on the SSS the Sykes Sliding Scale. He’ll introduce you to his PREPARE acronym, which includes things you should look at, including pattern and price, risk and reward, ease of entry and exit, and more. The Steady Trade take: Tim and Stephen talk about Sykes’ PREPARE acronym and how valid it is as a checklist, discussing each point and considerations that you as a trader should keep in mind. The more obvious the pattern, the more traders will be interested in taking the same position. So you need an edge, and this requires plenty of study of the past to be prepared for the future. Tim Sykes knows this, so he considers himself a “glorified history teacher”. The Steady Trade take: Tim and Stephen talk about how charts can help you gain an edge by looking at the past and looking at consistently repeatable things. If everyone is scanning the same stocks, you need to be prepared so that you can be the early bird. Got a question for Tim and Stephen? Visit the “submit your audio” portion of the website to ask us anything. You may be featured in an upcoming episode. Very good you two, thanks for breaking down Tim Sykes work sheets, “WHAT MAKES A SUCCESSFUL TRADER?” and “THE SYKES SLIDING SCALE (SSS)”. I finely understood most of it. Throughly enjoyed it. I appreciate the commentary as it helps me to better comprehend the steps as noted by Tim Sykes. I did watch the videos a few months back but its a lot to take in for a new guy like myself. Thanks! Love, love, love your podcasts. This is another great one! Thank you. Another great podcast guys. You are showing why the Trader Checklist is such an important training tool.